Butterick patterns for girls, Delineator, February 1927. A young teen (up to age 15) would probably be happy to wear a dress (right) so much like adult fashions of the day. The button detail on the child’s outfit at left is a nice touch, too. Their silhouettes are very different, however. Butterick styles for teens 15 to 19 years; Delineator, February 1927. There is nothing babyish about these. 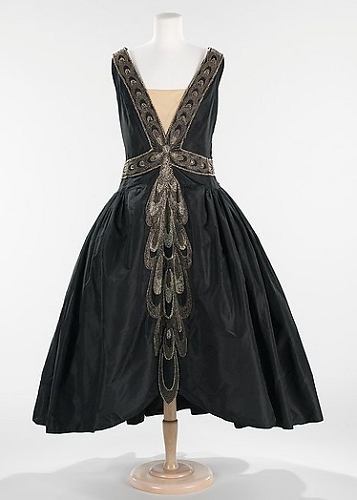 There was often a distinct style difference in dresses for young girls and those for adults in the Twenties (and in the early Fifties, for that matter), but Butterick patterns sold for size “age 15 to 20” were often described as designs for teens and “small women.” In fact, since those styles were usually shorter (what we might call “petites,”) the proportions of styles for teens often look quintessentially “nineteen twenties” to modern eyes. Butterick patterns for teens 15 to 19, from Delineator, February 1927, p. 27. Jacket 1229 was also illustrated in women’s sizes in the same issue. Nos. 1274 and 1288 were sold as dress patterns, although they look like separates. Dresses for little girls usually were fuller, with no hip belts, and those for very young girls often include matching knickers or bloomers. 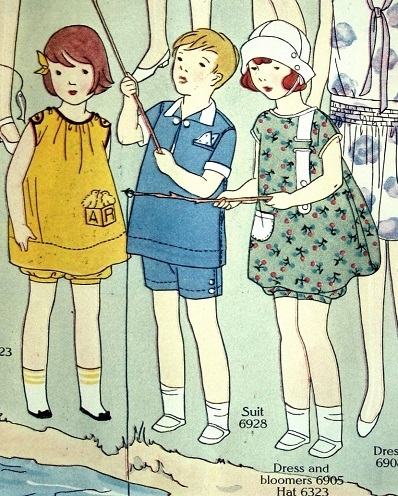 Dresses for girls up to 10 years old: Butterick 1261 and 1277; Delineator, February 1927, p. 28. Young girls were not sexualized by dressing them in adult styles. Smocked and embroidered “peasant” dresses were popular adult styles, too. You can see smocking on dress 1267, below. These dresses for older girls are mainstream fashions. Dresses for teens 15 to 19 years old. Butterick patterns from Delineator, February 1927. The robe de style in the middle was often suggested for bridesmaids, but older women sometimes wore more sophisticated versions. Three hair styles, 1927. I have no idea what is going on with the two-tone hairdo in the middle [a silk hat? ], but the one on the left could be worn in 2018. 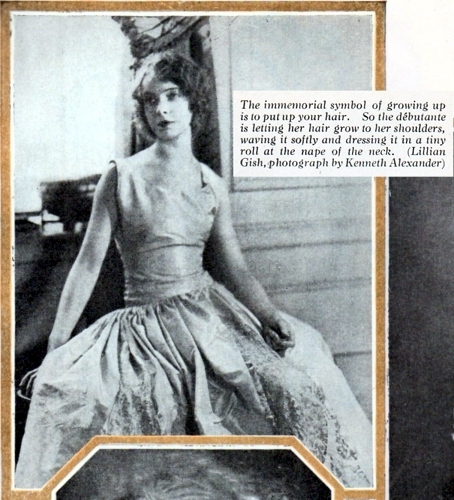 An asymmetrical cropped haircut, 1927. Tres chic. The back is shingled. Butterick 1272 has a sheer yoke and sleeves on a darker silk dress. Delineator, February 1927. It was also available in women’s bust sizes 38 and 40. Coat 1256 has a curved hem, revealing a pleated dress beneath. The scalloped sleeves and embroidered collar add complexity to a simple style. Details of Butterick coat 1256, from 1927. Embroidery on the inside of the collar is a clever touch, but isn’t mentioned. “For women and young girls 33 to 48 bust” — a larger than usual size range. The back of the collar is scalloped, too. Butterick patterns for teens 15 to 19; Delineator, Feb. 1927. This compose dress, Butterick 1269, uses three shades of the same color, or three different colors. This back view shows a long, vertical scarf tie in back, which creates a more slender rear view. Another compose dress, in two colors. Like most dresses with a basque top, which could fit quite tightly, Butterick 1279 closes with a snap and/or hook and eye opening under the left arm. Another dress using three colors, Butterick 1267, is essentially a tube cinched with a belt at the hip, and would have been unflattering to almost every woman, in spite of its long vertical stripe. Outfits for young women 15 to 19, these are “very twenties.” The pleats on each skirt are treated in a different way — quite a variety. The skirt of Butterick 1274 has inserted pleated godets — plaid cut on the bias, in this illustration. The skirts of two-piece dresses like this one often hung straight from a sleeveless underbodice, so there was no shaping needed at the waist. Right, below, is another view of coat/jacket 1229, this time lined with the same fabric as the dress bodice. Here, jacket 1229 combines with dress 1298 to create a suit. It is lined with the same fabric as the dress bodice, although the illustrator seems to have colored in one lapel by mistake. Butterick 1288 shows a Russian influence in its asymmetrical closing. Below, these dresses for younger teens do reflect adult styles, although dresses with a Bertha collar like 1271 were usually recommended for very young women. Two Butterick patterns for girls up to 15 years. Left, No, 1259; right, dress 1271 with a Bertha collar. Delineator, February 1927. 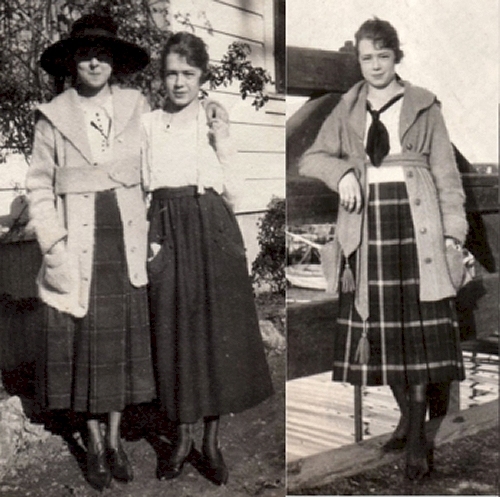 The dress on the left, with a cape-like Bertha collar (from 1926) is much more girlish than the one on the right, although both are for teens. Beside Butterick 1271, for girls aged 8 to 15, is Butterick 1242, for a girl six or younger. Her doll, Butterick 426, is dressed in matching fabric.